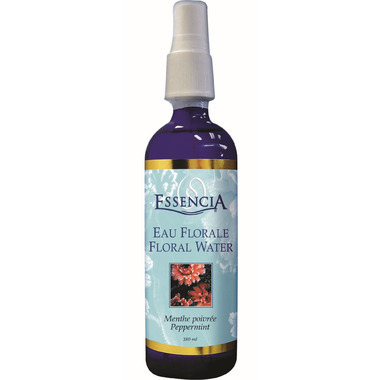 True floral waters from Provence, Essencia floral waters are obtained by steam distillation of the flow- ers and / or leaves of the plant. Alcohol-free, floral waters are natural tonic lotions that preserve the plant’s aroma, as well as its therapeutic and cosmetic properties. PEPPERMINT (Mentha piperita, leaves and flowers): Very refreshing tonic lotion for every skin type. Refreshes and soothes shingles and sunburn. Excellent rub for migraines and analgesic for tired heavy legs, overheated feet and muscular pain. ACTIVE INGREDIENTS HPUS: 100 % natural hydrosol, from plant’s distillation; no alcohol. CONTRA-INDICATIONS: Allergy to a specific plant. DIRECTIONS FOR USE: Apply generously to the face and body using a cotton ball or a vaporizer. Do not rinse. FORMAT: 180 mL cobalt blue plastic bottle. Great smell, but not quite strong enough for what I want. The pump broke after only a couple sprays. Very refreshing in hot weather. Smells great, not overpowering. Will use frequently and will order again. The mist is nice, fine mist. Love these floral waters! The mint is so refreshing after a shower, just spritz on your face and you are awake! Smell very natural. I was in Provence last month and this is a nice reminder of a wonderful holiday. Will try the rose spray next. I didn't notice any healing effects of this floral water. But it is very cooling (it's mint after all lol). So, I guess it'd help if you want to ease the pain from sun burn, or something like that.